A great review Jacqui and I am now very keen to read this one. I am especially sold on the fact that its unsettling and an absorbing mystery. I am quite a fan of Ross MacDonald’s Lew Archer novels. I haven’t read all yet, but the few I have were superb when it came to descriptions of California and in the way they were tightly plotted. I think you’d like this, especially as you’re a fan of Macdonald. It’s a neat little mystery with enough depth in the portrayal of Meecham to give it another dimension. I really warmed to him as a character. I’m not a hardboiled crime fan but I’ve come across Margaret Millar’s name before in reviews and been tempted. Do you think it might work for me, Jacqui? I’m not sure, Susan. Maybe…but then again maybe not. Even though Meecham is a lawyer, he’s very much in the style of a classic private eye – hence the hardboiled ‘feel’ of the book. Have you tried anything by Dorothy B. Hughes? I think she might be more your cup of tea than Margaret Millar. In a Lonely Place is excellent, as is The Expendable Man. Even the crime fiction sceptics in my book group enjoyed these two, so you’d be opting for a safer bet? That does sound more the ticket, then. I can always pass it on to my crime fiction loving partner. Thanks! While there’s a crime near the beginning of The Expendable Man, it isn’t really a straight ‘crime’ novel as such. If anything, it’s more a fight for justice as the central character tries to clear his name. I think you’d like it, particularly as the characterisation is pretty compelling and strong. Cool. Let me know how you get on with it. I’d be interested to know. The characters sound very well crafted. Like A Life in Books, I have not read much in this genre, but I would like to delve into it. It also sounds like this would make a good film. Yes, definitely the potential for a good movie here. I’ll have to take a look at wiki to see if it’s ever been filmed! This is an author that I hope to get around to some day. Glad to hear your positive thoughts on this book. I love the cover! I didn’t know who she was married to – interesting! Ah, yes – she’s Canadian by birth! Definitely one for your list, then. I think this would be a great one to try. As far as I know, it’s considered to be one of her best (although Beast in View gets a lot of attention). The cover’s great isn’t it? And I like the fact that the colour scheme differs from the conventional expectations of a crime novel. The cream background really stands out against the dark blues, reds and blacks of most books in this genre. I should give Millar another try. I read her Beast in View a couple years ago and did not love it, but this one intrigues me. That’s interesting, especially as it’s the one she most famous for! I really liked this, I must admit – particularly the character of Meecham as he came across as very smart and personable. I think The Beast In View must have been so much more impressive/surprising in its day. I enjoyed the others more as well. (There is a sweet little series of omnibus reprints from Syndicate Books, with a series of images on the spine that line up together nicely on the shelf to make a tableau picture, for those who don’t mind the fine small print in such editions – dark, if small, in this instance.) Looking forward to hearing more as you read through her books! Thanks, Karen. Yep, there’s enough good stuff here to keep it interesting – not just in the mystery which is very twisty, but in the characterisation itself. There’s just enough nuance to give it that edge. Definitely worth considering when you run out of BLCCs to read! Glad to know you liked this as I have several Millar’s on the shelf. I read Beast in View and thought it was ok but nothing too spectacular. I think you’d like this one if you have it in your collection. There’s a bit of mileage in the character of Meecham, in particular. I don’t know if he appears in any of her other novels, but I’d be open to reading some of them if he does. I bought this a couple of months ago, very much looking forward to it. I should move it up my tbr. I’d be very interested to see how you get on with this. Hopefully you’ll prefer it Raymond Chandler’s The Big Sleep, which I know you found a bit out of synch with your tastes! I hope so, I wasn’t keen on Chandler but I like Patricia Highsmith and Dorothy B Hughes so I am hoping that she will be closer to their style. She doesn’t use as many similes as Chandler, that’s for sure. I’m hoping you’ll find it somewhere between the two (Chandler and Hughes/Highsmith). As you know, I’m a fan of Ross MacDonald – in fact I read The Goodbye Look just recently. Hopefully I can pick up a copy of this soon – and I hope Pushkin will reprint some more of her work as they’ve down with other authors. I think you’d enjoy this one, Grant. It’s an enjoyable little mystery, plus the writing is crisp and to the point. I’d like to see more Millar from Pushkin Vertigo too; she’s a good addition to their list which sometimes feels a little male-heavy! This sounds really good Jacqui – I do like some hardboiled crime. I’m certainly glad I read it. 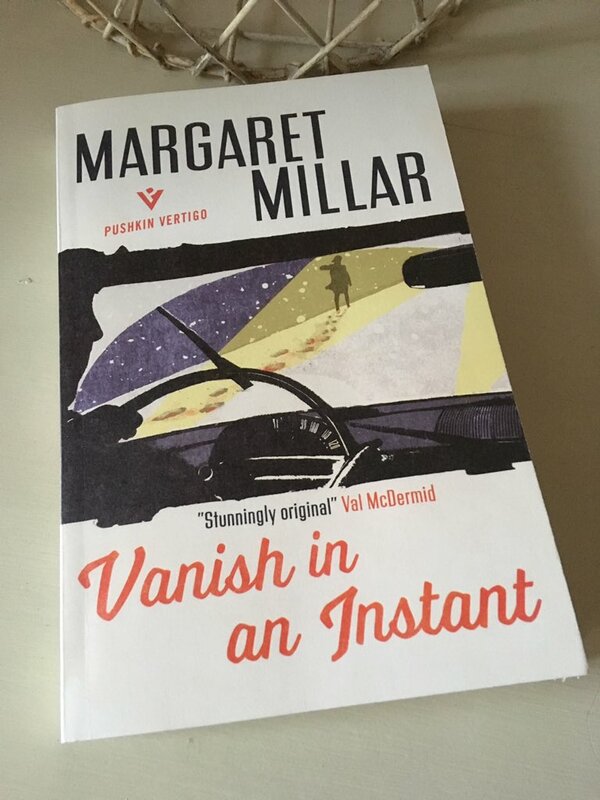 Check out this review of the book, Vanish in an Instant by Margaret Millar, from this post on Jacqui Wine’s blog. Thanks for sharing my post, Don Massenzio, very kind of you. It does sound good. I have one of her novels and one of Ross MacDonald’s novels on my piles somewhere. I couldn’t tell you which ones as I bought them ages ago. I should really stop buying new books with all the great ones I’ve already have. Do you feel the writing of her and her husband is similar? Of the two, I’d say Ross Macdonald is closer to the classic hardboiled style of Chandler and Hammett, especially in the early days when he was still settling into a rhythm. (The mid-late books in his Lew Archer series are generally considered to be stronger than the early ones, but even the first two or three are worth reading. I really liked The Drowning Pool, number two in the series). I don’t think Millar is quite as wedded to similes as Macdonald or Chandler – or maybe it’s more accurate to say that I don’t recall seeing as many in Vanish. Her prose is pretty crisp and to the point, which makes it a tight read. Thanks a lot for these clarifications, Jacqui. Haven’t read her for years, but I do remember How Like an Angel made a deep impression on me. That was a great depiction of a cult a long time before they became mainstream. I agree she is worth republishing. How fascinating, a writer ahead of her time. I’ll have to look it up. Thanks. Marina Sofia kindly sent me a copy of this. I must read it soon. Great review. Thanks, Janet. I hope you enjoy it. This sounds great Jacqui, and perfect reading for the weather we’re having at the moment! I’ve not read any Millar but you’ve definitely put her on my radar now. I was pleasantly surprised by this, a well-plotted mystery with very little down time. Plus, as you say, it’s ideal for a snow day. What better way to spend to chilly afternoon than to curl up with a good book? I’d definitely be open to considering others by Millar, especially if they’re in a similar vein.